For purposes of this essay, I will have to start back in July of 1996. It was during this time period that I was incessantly poisoned by DOC staff with an overdose of my seizure medicine for about 10 days. Fortunately, I escaped coma & death, however, the DOC decided to repudiate the residual adverse effect (some form of ataxia) subsequent to being released from the hospital. Said repudiation lasted for the better part of the next 71/2 years, except for the rare occasions when they were forced to provide me with assistance walking. It was during this time that I withdrew into myself becoming anti-social, hopeless, suicidal... and some more stuff. Every time I attempted to get medical and clinical help said staff avoided addressing my issues by stating that I was faking or "malingering." Thus, I was forced to not seek their help because they became part of the problem. On July 12, 2001, while in punitive segregation at GBCI, I witnessed the death of my close friend, Mr. Kelvin Jackson, who was only several yards away from me. He had a seizure that lasted for 2 hours, and only ended when he died. During said 2 hours I constantly pleaded with GBCI staff to go into his cell and check on him. I kicked & punched my door while yelling at the top of my lungs for them to provide Kelvin with medical care. In response, said staff repeatedly threatened me with discipline if I didn't stop because they believed Kelvin to be "faking" a seizure. Annoyed by my said incessant conduct for 2 hours straight, said staff finally went into Kelvin's cell, at which time he was already dead. Since that day, something happened inside of me that I don't know how to explain. The day after Kelvin's death a "crisis intervention worker" told me that I will be o.k. as time goes by. I started hearing Kelvin's voice, & having nightmares & ugly daydreams about Kelvin's death. Thoughts of suicide became a fabric of my existence. On September, 5, 2001, I attempted suicide by hanging, but the staff ran in my cell & put me on Observation Status (Suicide Watch). On September 6, 2001, I was transferred from GBCI to Supermax. From September 6, 2001 to duly 3, 2007, I was entombed at Supermax. Until they decided to build outdoor recreation cages in 2005, I was only able to see the outside only twice: when I was rushed via ambulance to the hospital in 2002; & when I went to outside court. Otherwise, I was smothered with the suffocation of being buried alive. Shortly after being transferred to Supermax I started having vivid visions of Kelvin. At first I was terrified & tried to tell Supermax staff about it but my efforts only gained me a "faking" label by them, in addition to being constantly harassed & ridiculed by inmates as being "crazy." Thus, instead of running from said visions, I embraced them. I embraced Kelvin & he became more real to me . I protected him, tolerated him. 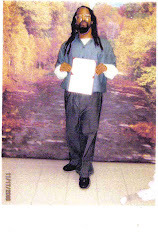 I almost died twice at Supermax: once when Supermax staff refused to feed me for about 3 weeks straight because I was unable to put my pants on during meal times because Kelvin needed them to wear or he would not have been fed; the other time was a couple of months later when I attempted suicide by hanging but said staff ran in my cell & cut me down. For about 3 weeks said staff stripped me naked of all clothes (except underwear), property, hygiene items and bedding and left me in a freezing cell. They called this their behavior management plan but I call it torture. July 3, 2007, I’ve been here at CCI. Adapting to general population is hard. I’m still withdrawn. I don’t like being around people. Being me is scary and unpredictable because I don’t know what’s up with me. Accompanied documents may provide some insight into my mental state. Everyday there’s ineffable pressure on me to try to cope, which is very hard , considering that I am trying to keep all of the above buried.